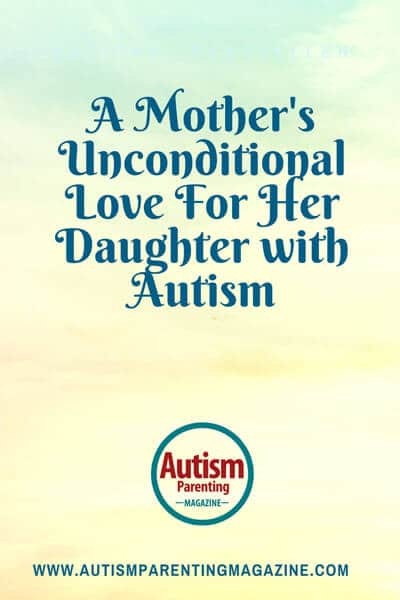 I recently wrote a book about my daughter’s life journey with autism, The Autistic Author and Animator, and it contains the essence of unconditional love for our autistic daughter – not only from my family and me, but from a group of people who I call my Dream Team. This includes a play therapist, speech and language pathologist, psychiatrist, respite care workers, daycare personnel, community outreach programs, teachers, and friends who have accepted Jenny for Jenny. Last, but certainly not least, the silent hero and Jenny’s best friend who always loved her unconditionally: her dog, Mr. Sparkles. Jenny was diagnosed at three years old with low-functioning autism. I was totally in the dark when I was told this, as I had never heard the word autism before. However, without knowing it, I had already been introduced to it through Jenny’s behavior with her not talking and just grunting, pushing me towards what she wanted, spinning herself in circles, demonstrating her extreme sensitivity to all five senses, and exhibiting pickiness about foods. She had terrible fits when her routine was changed, and she would bite, hit, or scratch herself. I had to put her in a lukewarm baths to settle her down and ease her into calmness. There was no eye contact, and she preferred to be in a world of her own. Jenny would love to line things up, and if you tried to join in or touch one or change a line up, the fit was on. She didn’t like to share or play with others. I knew I needed to get to the bottom of this for Jenny’s sake. We would get horrible looks and comments from people when we were out in public about Jenny’s behavior. At first, I was always apologizing and explaining, “She is not a bad girl; she doesn’t understand or mean to be like this.” It broke my heart for Jenny, because I wanted to protect her. Wanting to get answers, I took Jenny to our general practitioner. When I told him that I felt something was very wrong and she needed to see a specialist, he looked at me as if I was a neurotic, over-protective mother. I explained we had tried to do a hearing test and it couldn’t be completed as she had fits. He wouldn’t send me to a specialist, but sent us for another hearing test, creating the same outcome. I went back to his office and demanded for Jenny to see a pediatrician. I was never an assertive person, however, going through the process of autism, I became one and I got the appointment. Within fifteen minutes into the pediatrician appointment, she said Jenny had autism and needed an assessment with a specialist. The pediatrician then informed me an appointment had been booked, but had to wait over a year. I said, “OMG, over a year, Jenny’s needs help right now!” She reassured me that we would have contact with appropriate care services and support. Hence, the Dream Team I mentioned earlier. I was very fortunate to have caring, hardworking individuals who went the extra mile for Jenny. They became our second family. I hear of families who say their child has slipped through the cracks, with no one listening to concerns or having a game plan for their child. However, from the day I was told about Jenny’s autism, I never looked back, always stayed positive, and made sure that she was getting every possible support and program out there and carried it on at home. Our Dream Team was always there for us before and after the specialist assessment; they were our Guardian Angels. Since Jenny was a little girl, she loved to draw and would watch animation movies over and over again. I seriously thought her hands would drop off as she was constantly drawing, writing stories, and making flip pages. In the 10th grade, I surprised Jenny as I made an appointment with an Animation Studio in Vancouver, BC to go on a tour. We lived about five hours away in Vernon. In the middle of the tour, Jenny stopped in the hallway and said, “I just want to stay here and animate.” She loved everything about it, and Justin, who did the tour, saw this and said we should enroll her into an Animation School when she graduated high school. I remember on our drive home, Jenny said to me that she didn’t know if she would graduate and didn’t think they would accept her into Animation School. I stopped the car and looked at her and said, “Jenny, you will pass 12th grade, you will get into Vancouver Film School, I believe in you, I am confident in you, trust in me Jenny. “Well, when we got home, I phoned Vancouver Film School, made an appointment with admissions, and we took off to Vancouver again. The admissions counselor was very taken by Jenny and encouraged her to apply. I tip my hat off to Jenny as she worked extremely hard to pass her classes, and in between all of this, there was a lot she had to send for the application. Jenny never wavered; she trooped through the trenches, climbed up the slippery mountain slopes, finally made her way up to the peak, and then jumped onto the clouds. Jenny graduated high school in 2011 with honors and received scholarships. She also found out before graduating that she was accepted into Vancouver Film School. Funny story with that – she told me to open up the school letter when it came, whether she was home or not. Well, it came on a day when she wasn’t home. When I opened it and saw she was accepted, I began screaming and I bet the neighbors must have thought I was in trouble. I drove to the store, got “Congrats” helium balloons and a card, and kept the acceptance letter with me. Off I went to the school, asking the receptionists if I could go to Jenny’s room. They were so happy for Jenny and gladly said, “Go for it.” She was in video class and the room was dark, so I knocked a couple of times and then went in and ask the teacher if I could just talk a minute with Jenny. Wouldn’t you know it, there she was at the front of the class. I ran up to her and was jumping up and down and letting her know she was accepted to Vancouver Film School for Animation. She looked stunned and said, “What are you doing here, Mum?” Her friend explained she had been accepted to Animation School. As I ran out, Jenny later told me she said, “What just happened, did my Mum just tell me I was accepted to Animation School?” Apparently, I was like a flash coming into the room and a flash going out. We laugh about this still today. In between 2D Animation and 3D Animation, I got in contact with a publisher who wanted to take on Jenny with her novel and myself with my book about Jenny’s life journey with autism. In July, 2011, we moved to Vancouver, as Jenny’s classes started in August. We had no family or friends there, and she could not do it on her own. Jenny deserved this opportunity. But most importantly, when you are a parent and have watched firsthand as your child battles the odds, selling the house and moving becomes no big deal. And this is what I did – I gave her the world to follow her dreams and achieve them. I couldn’t be more happy or proud of her. I can happily say that Jenny just turned 23 years old, is a professional 2D and 3D Animator, and is a graduate of Vancouver Film School. She is also a bestselling author of her Fantasy Fiction novel, Dysnomia – Outcasts on a Distant Moon. It is the first of a trilogy and she does her own illustrations in it. It was a best seller in pre-order sales — our publisher was blown away by this, as that is not the norm. Her book is getting quite the following and she is in the middle of writing the sequel. She also did animation and illustrations for a film for Super Channel this year. Jenny and I are both official spokespersons for ANCA/Naturally Autistic and have been involved with their World of Autism Festivals since last year. And there it is: the unconditional love of a Mother and also the inspiration that Jenny is – not only to me, but to every person who has met and worked with her. To me, autism is not a death sentence, so to speak, but a richly fulfilling life sentence. Autism rocks, autism rules, and autism connects. Janet Walmsley is a born and raised Manitoban, who has also lived in Vernon, BC, Yellowknife, NWT and Germany. Janet was a dental assistant and hygienist for 27 years. She now lives in Vancouver, BC Canada, and along with being a mother to Jenny and her son Chris, Janet has an active professional career in acting. Her theatre career spans decades, and she has been in film, TV, commercials, and voiceovers for the past six years. Recently, Janet was nominated for Best Supporting Actress for a Comedy at the 6th Annual Indie Awards in Los Angles and was submitted for Leo Award nomination in BC. Since Jenny was first diagnosed with autism, it has been Janet’s mission to support her daughter 110%, raise autism awareness, and bring out the positive aspects of autism – not just the usual stigma attached to it. Even though she was diagnosed with Breast Cancer in July of 2014, Janet published her own book, The Autistic Author and Animator, A Mother’s View of a Daughter’s Triumph, as Janet and Jenny wanted to publish their books at the same time and do book events and talks together. It is also a bestseller, and Jenny’s story is reaching out and touching the hearts of many people. Jenny Story was born in Yellowknife, but has lived the majority of her life in Vernon, British Columbia. Jenny graduated Grade 12 with Honors and scholarships and then moved to Vancouver to attend Vancouver Film School for Animation. She is now a 2D Classical and 3D Digital Character Design Animator. Jenny recently just finished working on a film for Super Channel with her animation and is about to start on another film. Jenny also published her first novel of a Trilogy in May 2015, and right from pre-order, it was an Amazon and Canadian Best Seller. She is currently working on the second novel for the Trilogy. Despite being diagnosed with very low functioning autism at three years old, Jenny has blossomed and always remained focused on pursuing her dreams. She is passionate in inspiring others to do the same. 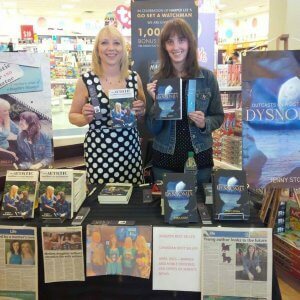 Janet and Jenny are doing many book signing events with meet and greets and all forms of media, including TV, radio, newspapers, podcasts, blabs. They are also both Official Spokespersons for ANCA/Naturally Autistic and The World of Autism Festivals held every year.